In this CIO Magazine interview, David Goulden describes how Hybrid Cloud gives businesses the agility to leverage public cloud services alongside enterprise applications, seamlessly and securely. 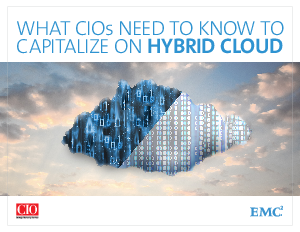 Learn why Hybrid Cloud is the most efficient and automated platform for leveraging mobility, social media and big data. Gain insight into the surprising speed and ease of deployment, and the flexibility and scalability that it delivers to IT organizations.